Utah has so many unique landscapes and features, and the Great Salt Lake is certainly one of them. Imagine the surprise of the pioneers who settled the Salt Lake valley when they discovered this huge body of water was more salty than the ocean! In a land where water is scarce, it must have been quite the disappointment. I grew up in Utah and had only been to the Great Salt Lake as a young girl so I could hardly remember what it was like. John and I decided that it was time for us to explore what Antelope Island has to offer. What we found was truly a rare experience you can’t find anywhere else. Antelope Island is located north of Salt Lake City, Utah near Syracuse. Take the Antelope Drive exit on Interstate-15, exit 332, and head west for approximately 15 miles. As you approach the causeway to reach Antelope Island, you will be stopped at a ranger station. There is a $10 fee per car to enter the State Park. Antelope Island is a desolate landscape with very few trees and shade. Plan to be in direct sunlight for most of your trip to the island. Two primitive campgrounds are the only places to stay overnight on the island and there is one small restaurant with seasonal hours at the picnic area, so consider bringing your own lunch. This trail was the gem of Antelope Island for us. We originally thought we would try the Frary Peak trail, which is 6.6 miles round trip. Jackson made it very clear to us that he was not in the mood for a long hike, so we decided to reconsider. This trail has gorgeous, sweeping views of the Great Salt Lake and has a lot of fun rocks to climb on when you get to the top! This is a short, uphill climb with one small section (30 steps or so) that hugs a cliff so if you take little children just watch them carefully. The trail is 0.4 miles one-way. The trail starts from the west end of the parking area near the pit toilet. Buffalo Point also has an interpretive center and some picnic tables with a spectacular view if you do not want to or cannot hike. Take a left as you enter Antelope Island and follow the road toward the White Rock Bay Campground. Make the first right after you pass the road to the Bridger Bay Campground. You will see the trailhead parking lot about halfway up the hillside. Yes, you can swim in the Great Salt Lake! We did not even pack our swimsuits because it did not even occur to me that I would want to, but I did regret it. We did wade in the water and it was great. Because the lake is so shallow, it stays quite warm. The sand under our feet was soft so we were able to walk around without shoes. A few people were floating like corks about 30 feet away from where we were wading and it looked like a lot of fun. Take some flip-flops with you. It is a long trek from the picnic area to the water, and during your trek you will find several different consistencies of sand. We tried to walk barefoot as we started because the sand was deep and filling our tennis shoes, but as we got closer to the lake the sand become hard, crusty, and sharp on our feet. We wished we would have just brought flip-flops. Seasonally you will encounter huge swarms of flies and gnats near the water, so be sure to check the website before you go. This usually occurs from about April – July or so. Because of this, I would not recommend taking food with you down to the water. Bridger Bay Day-Use Area has shaded tables, nice restrooms, and showers to wash off the salt after a swim. Take a right as you enter Antelope Island. Follow the road past the Visitor Center and you will see the parking area on your right. 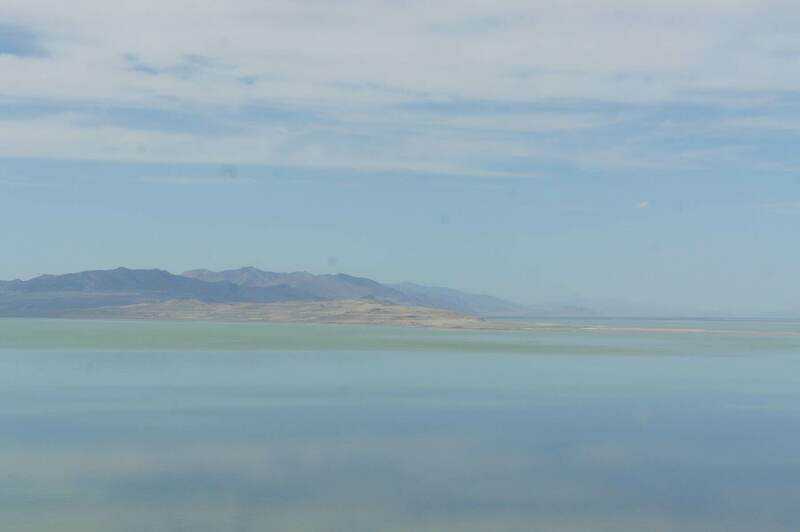 This trail is a short .25 mile walk out to the end of Lady Finger Point and provides a great view of Egg Island and the north side of the Great Salt Lake. For many, this is a great bird-watching area. We even saw a few jackrabbits! This is a great little trail for kids. Take a right as you enter Antelope Island from the causeway, pass the marina, and you will see a shaded picnic table and some restrooms next to a parking area. This is the trailhead. If you get to the Visitor Center you have gone too far. The Fielding Garr Ranch was the first permanent residence on Antelope Island and was inhabited from 1848 to 1981. We were able to take a guided tour of the Ranch, given by a park historian, to learn all about how the homesteaders were able to survive in such a desolate place. The State Park occasionally provides guided tours, but you do not need to be guided to visit and experience the Ranch. Fielding Garr Ranch is a hands-on museum, which means that you can touch and feel almost everything you see. The home and the barn are open to take a walk through. There is even a water pump you can try and some fake animals you can rope. The Ranch is also the only place on the island that has big enough trees to provide some good shade. A grassy area and picnic tables make a nice retreat if you’ve had enough of the sun and the sand. Take the left fork as you arrive on Antelope Island and follow the road signs (taking another left) to the Ranch. Stay on the road for approximately 11 miles to reach the parking area. It is no secret that buffalo are the favorite animal in our house. John and I both love the American West and how buffalo symbolize the wild frontier and wide open spaces. John could not stop reminding Jackson that he was going to see his first buffalo at Antelope Island. Needless to say, it was a big deal for us to see at least one on this outing and we were not disappointed! Always use caution when viewing wildlife. Bring a camera with a good zoom lens to avoid getting too close. Buffalo have been known to charge people if they feel threatened. We found that the best place to view larger groups of buffalo were along the road on the way to the Fielding Garr Ranch. We had a great outing and hope to make it back out there again soon! What would you like to do when you visit the Great Salt Lake? Your Antelope Island post was so helpful! We did the Buffalo Point Trail like you suggested, as I was searching for the best way to see the Salt Lake. Terrific hike! Thanks so much for sharing helpful info and tips with others.
. We did the Buffalo Pojnt hike on your recommendation and it was a real highlight! A little windy and chilly in mid October, and too cold to swim , but still beautiful. As always your blog was very helpful. We went there yesterday for sunset and it was breathtaking view! This is a good place to visit in winters as the view of snow capped mountains is stunning , but on a sunny day. We went to Ladyfingers point as well for sunset ? Hi Prachi, that sounds amazing! I’ve actually never been there in the winter but it sounds magical. Thanks for the recommendation! We just took a day trip up there yesterday. It was beautiful! It stared out being a bit cloudy, but when we finished it was clear and sunny. The beach was amazing! And the bison were right next to the side of the road. Definitely a fun trip! Sounds like a great trip! I think that a lot of people don’t realize how much fun Antelope Island actually is….and we love seeing the buffalo too.